When you walk into Fair & Square Imports, every wall is lined with shelves holding beautiful products from around the world. From Mexican jewelry to felted trivets from Nepal, each piece is made by a skilled artisan and certified by a fair trade organization. This small shop in downtown McKinney is bringing unique, handmade items to North Texas while helping to alleviate global poverty through economic development. Walking around downtown McKinney in 2012, Kate and Andrew Jones felt at home. The young couple had recently moved from northwest Indiana after graduating from Valparaiso University. Andrew’s degree in International Economics had led him to his role at the Valparaiso International Center, where he worked in a role supporting the immigrant community and hosting cultural events. One event, the Fair Trade Christmas Festival, became a year round trade store at the International Center. “I loved how we were able to expose people to the fair trade process and give them an opportunity to make more conscious shopping choices,” said Andrew. Combined with Kate’s marketing degree and experience, the idea of starting their very own retail store seemed like the right fit. And McKinney was the right fit too. Kate grew up in the Richardson area, so Texas was a natural choice to be near family. The historic square in downtown McKinney had the perfect storefront available, and 30 days after the lease was signed, Fair & Square Imports was open for business. 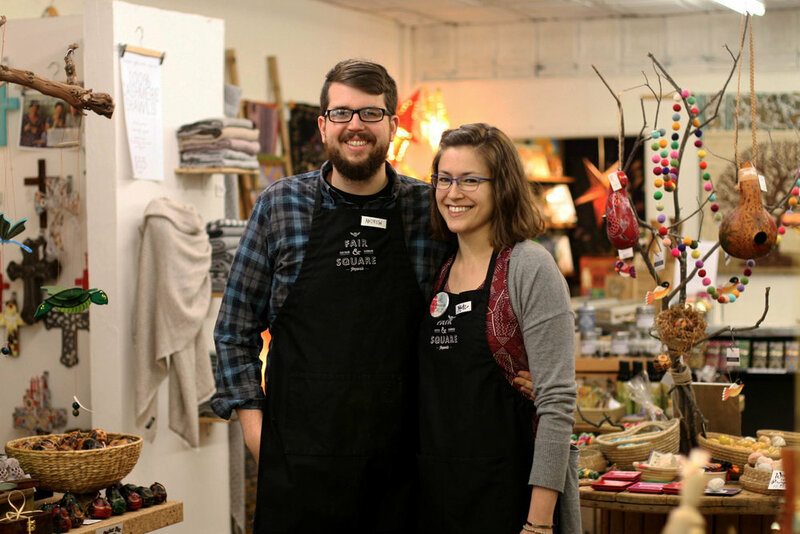 Bringing supplier relationships with them from the shop in Indiana, Kate and Andrew were able to fill up their new space with meaningful, handmade goods. “Everything fell into place so fast, we actually started our displays with folding tables covered in old curtains from our house,” admitted Kate. But after the first few months in business, they could see how the North Texas community was coming together to support them and their artisans. Almost 90% of the shop’s products are certified by the World Fair Trade Organization or the Fair Trade Federation, with a little bit of space left for local nonprofit goods, like headbands from the Vickery Trading Company in Dallas. Over 40 countries and 60 artisan groups are represented at Fair & Square. One of Kate’s favorite products is the soapstone hearts, carved and dyed by hand in Kenya. “Soapstone is found in many areas of the world where there is tectonic activity, but in the Kisii region of Kenya, the soapstone is either white or very light gray, so it lends itself to being dyed different colors,” she said. Eighteen Kenyan individuals are employed through the soapstone carving business. Each heart-shaped stone is carved with encouraging words that are perfect for a sweet gift. Some stones are left blank and can be hand-carved with a custom message right in the Texas store. After spending years around fair trade products, Andrew and his friend Steve Lehmann came up with an idea for a handmade teddy bear that would serve child refugees. They started with a pilot program in Jordan with 100 bears, and then Threadies was born. Each bear is handmade by a group of Christian and Muslim women in the West Bank area of Israel using overage upholstery fabric that is locally sourced. 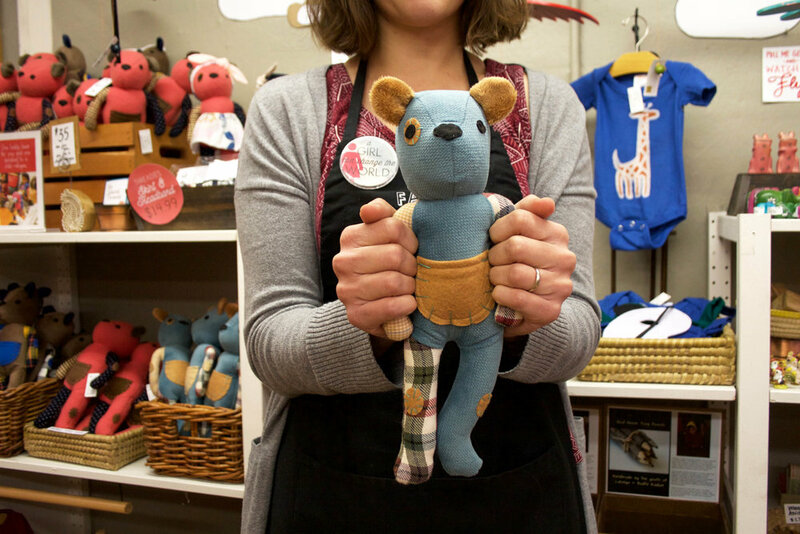 When a Thready bear is purchased in the US, one is given to a child in a refugee camp. The bear that is given comes with a coping kit, specifically designed to be used by counselors while talking with children about their circumstances. “Over half of refugees are children, they are at high risk for developing PTSD, so these bears are used with camp counselors of the camps to help the child project their feelings onto their Thready,” shared Andrew. The fuzzy ears, small pocket, and lack of facial expression all strategically help children who have fled their homes due to violence. Threadies also help to create a connection with children in the US. Threadies that are purchased domestically come with a poem about what a refugee is and how you can help them. The two bears, one in the US and one in a refugee camp, are twins, connected by matching ear fabric. More than 5,000 bears have been given out in the first 18 months of the program. Together, Kate and Andrew are creating a strong community around Fair & Square. By introducing Texans to a curated group of handmade products that support families around the world, Fair & Square is tapping into that big Texas generosity and unique style. For those in the McKinney area, Fair & Square hosts regular DIY events as well as monthly storytimes for children. And for all of the chocolate lovers, Fair & Square features an epic collection of Divine chocolate bars. If you are interested in learning more about Fair & Square or the fair trade process, visit their website or stop by their store for a chat. Both Kate and Andrew love to answer questions and even visit local schools to present information on the fair trade economy. Their passion, transparency, and creativity is contagious, and this little store in McKinney is making a global impact.